I like adventure travel for a lot of reasons; it can be really fun, it makes me feel more alive and I like meeting like-minded people and exploring new places. The constant flow of new experiences and challenges shapes me. It forces me to learn not just about the world around me, but also about myself. It gives me a sense of perspective that actually makes me a better big-picture analyst of life’s ever evolving challenges. Through cultural contrasts, I find myself more willing to realize that there are different and equally valid ways of interpreting the world; refusing to settle for the first answer and initial guesses. However, in its most basic core, I travel because I need to, because distance and difference are the secret tonic of creativity. When I get home, home is still the same but something in my mind has been changed, and that changes everything. The Haute Route is a high-level traverse through the heart of the Alps that begins in Chamonix, France at the foot of Mont Blanc and ends at the foot of the Matterhorn in Zermatt, Switzerland. During this two week mountain trek, I saw the greatest collection of 12k-14k+ feet peaks in the Alps and visit some of the most spectacular valleys. The route is approximately 120 miles long, crosses 11 mountain passes and gains more than 40,000 feet in elevation. It is definitely a mandatory bucket list entry in my book. But why run another full marathon, especially only a week after completing the Haute Route? Well, it is long, difficult and challenging in all levels of human capacity- physical, mental, emotional and spiritual. But my main reason is quite simple… I am not fast, or at least not nearly as fast as my active peers so I tend to stick with longer and more challenging activities. Besides, while half marathons may be much easier and more fun to run, there is a level of prestige that comes from running 26.2 miles. 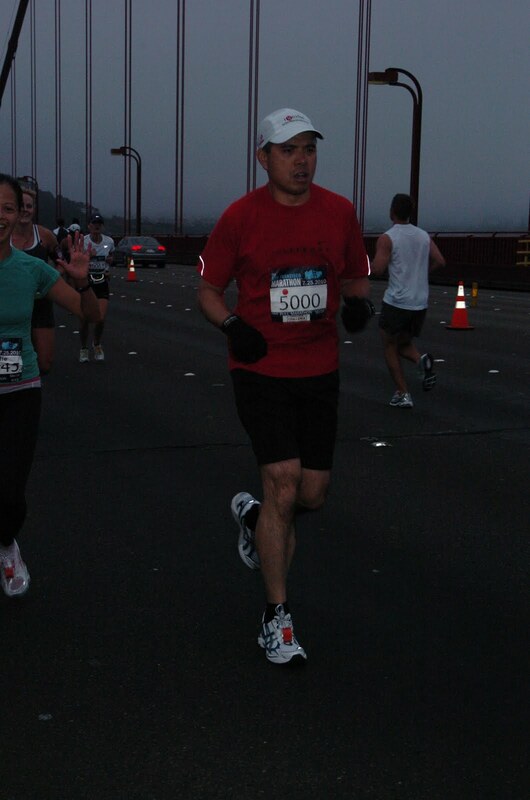 Also, the hilly but paved San Francisco race course was a welcomed change from the grueling mountainous trails of the Alps. I believe that Life should be lived fully instead of simply survived. I also believe that when we spend our lives preparing for the future rather than enjoying the present, we end up postponing our own happiness. Most importantly, if at the end of each day we are no different from when we started, we should beware. Sameness will surely create boredom and when we are bored, we are certain to be boring. I have great admiration for those individuals who constantly push themselves to extract the very best that their bodies and minds can muster despite the many overwhelming distractions and priorities in their lives. I’ve never been able to understand or relate to those individuals who go about their lives as if their life’s purpose is to simply grow old. I have found it physically and emotionally exhausting to be around those that routinely take the path of least resistance, take advantage of others for their own selfish gain, always have someone or something to blame for their predicament, or constantly sap the positive energy of others because they are not able to live their lives for themselves. Staying far away from these types of individuals is and will always be my number one priority in Life and when planning any vacation. Fortunately, these types don’t usually sign up for physically grueling/challenging activities and events such as the Haute Route and the San Francisco Full Marathon. I did not pick the Haute Route trip because it would be a walk in the park. I chose the Haute Route trip because of its difficulty level and the challenge it would pose for my lackluster fitness and almost non-existent backcountry technical expertise. 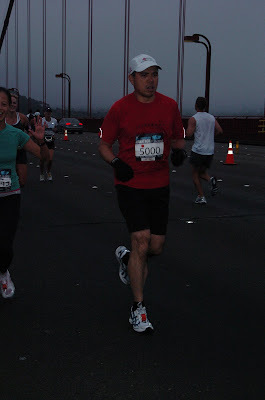 And of all the marathons available, I chose the San Francisco (Full) Marathon because many runners would rather avoid it due to its difficulty level and the almost surefire guarantee that a PR would most likely not be possible. Of course, my selection process brings about a certain level of risk/gamble but the reward is oh so immeasurably priceless and sweet. The Haute Route and the SFM were goals that are so worthy, it would have been glorious even to fail. Fortunately, I didn’t have to experience such glorious failures :-). The Haute Route trip and the San Francisco Marathon have successfully jump-started my fitness back in the right direction. As early as last month, with my recurring injuries, training setbacks, and stalled fitness encountered since the beginning of the year, I was physically and emotionally embedded in cement; now I find myself dancing on the petal’s edge, dizzy with aromatic fumes and bouncing on velvet. However, I couldn’t have done it without the support, encouragement and friendship of my Haute Route team, my friends and Jen Van Allen from Runner’s World Magazine. Over these past few weeks, I have had the privilege of meeting groups of individuals who have immeasurable kindness and unending thoughtfulness. They are the types that make positive and lasting impact on the people they meet. They make the world more hospitable, gentler, and more meaningful with their smiles, selfless good deeds, and wonderful ways. Special thanks goes out to Robert Travers who has an amazing ability to single-handedly and on-command make time stand still while putting fun back into living life to the fullest. Thank you for your patience, generosity, time and words of encouragement on my most difficult day of the Haute Route trip. I wouldn’t have made it up and over the mountain on that day without your help. Special thanks also goes out to Anne Wood and Kathy Willet for their frequent and constant offerings of food from their plates to ensure that I was well fed and appropriately fueled for the following day’s activities. To Alex, Katherine, and Angie, I, along with the rest of the human race, thank you for being such refreshing symbols of hope for our future. You go girls! More importantly, to Robert Travers, Arden Travers, Missy DiGiulian and Linda Croteau, I send my sincere thanks for making me feel like I was part of their tight knit group. I had an absolute blast spending time with each and every one of you in Zermatt, Geneva and GVA. And finally, to our superstar guides Stephane, Bernadette and Mike, thank you so much for tirelessly working hard and successfully ensuring our health and safety during such a long and rigorous trek where so many things could have gone wrong but didn’t. Their expertise, unequalled pride in their work, and professionalism was second to none and it was an honor to have followed their leads. Ultimately, special is a word I use for people who have had a dramatic effect on my life. To each and every member of my Haute Route team, you are that treasured friend who has forever changed my life. Thank you.